WASHINGTON, D.C. – January 31, 2013 – (RealEstateRama) — News reports on a foreclosure sale of Peninsula Town Center have raised questions in the community. Since some of those questions are being addressed to Hampton city officials, the city would like to help provide some answers. First, city officials have been assured there are no plans to close the shopping center. Stores and restaurants have leases that will continue under a change of ownership. Second, the city has no role in the deal. It is a private transaction between two business entities – Peninsula Town Center LLC and HSBC, the bank that loaned the money for construction. Third, Peninsula Town Center is current on its taxes. Since its official opening in March 2010, the Peninsula Town Center has contributed approximately $18 million in taxes to Hampton, counting sales taxes, property taxes and business-related taxes. Peninsula Town Center also borrowed from a local Community Development Authority, which holds the first property lien; the center is current on all money owed for that debt. Many commercial enterprises have emerged from financial restructuring moves to increase their sales and net worth. 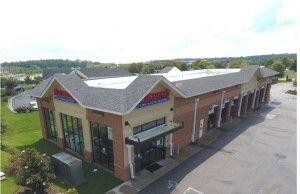 The bank that holds the note is expected to take ownership of the facility. They expect no interruption of business. Sales taxes generated by the center have exceeded the amount generated by the former Coliseum Mall. They have continued to rise each year since then. In 2012, the center’s gross sales – taxable and non-taxable – are estimated at $200 million. “We fully expect Peninsula Town Center to continue to be a thriving retail and restaurant center,” said Bunting. “The best thing we can all do is to continue to shop and eat at our favorite establishments that are there.